A few countries have fared well, but others have seen the value of their currencies fall dramatically. Egypt took the radical decision to let its currency float freely in November. The move was part of an attempt to ease its deep economic crisis and secure an emergency loan from the International Monetary Fund. The Egyptian pound immediately crashed 48% against the U.S. dollar. It has dropped even further since then, closing out the year 59% lower against the dollar. Nigeria struggled with low oil prices for most of the year, a trend that put its currency under pressure. The country relies on oil for 70% of the government revenue. Its economy was also hit by frequent militant attacks, many of which targeted the oil industry. The naira is down more than 37% against the dollar in 2016. The Turkish lira plunged 6% in the immediate aftermath of a failed military coup in July. It continued to slide in the second half of the year as ratings agencies S&P and Moody's downgraded its credit rating further into "junk" territory. Turkey has accumulated huge external debts over the past decade. The IMF and other observers have warned Ankara that its addiction to foreign money is unsustainable. The lira had shed 18% against the dollar by late December. The currency of Argentina, the second largest economy in South America, also struggled in 2016. 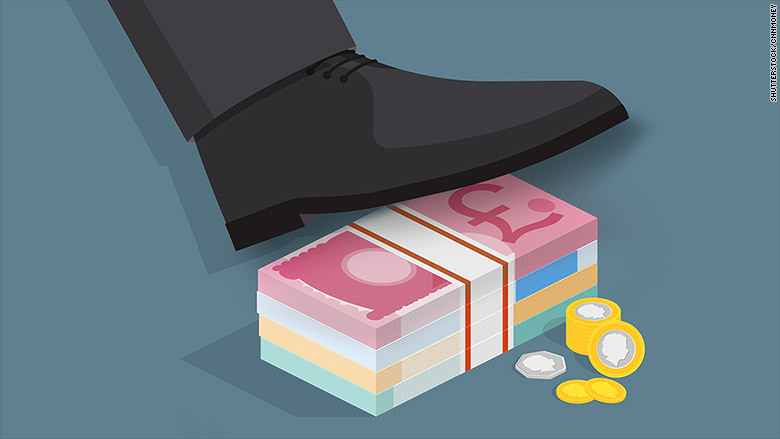 While key reforms have boosted hopes for a return to growth, the country's economy contracted by 1.8% in 2016, while real wages fell and inflation reached nearly 40%, according to the IMF. The peso lost 17% against the dollar. June's vote to leave the European Union sent the British pound plunging. 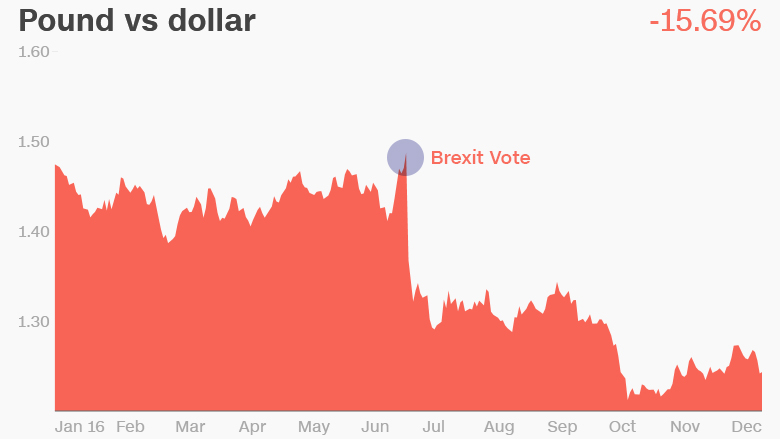 Investors are nervous about the impact Brexit will have on the economy and the pound has proven to be the primary victim: it's down 17% against the dollar. In July, the pound was briefly the wost performing currency in the world. It dropped even further in October, crashing to a 31-year low of $1.22. On the day of the referendum, it traded at $1.50. 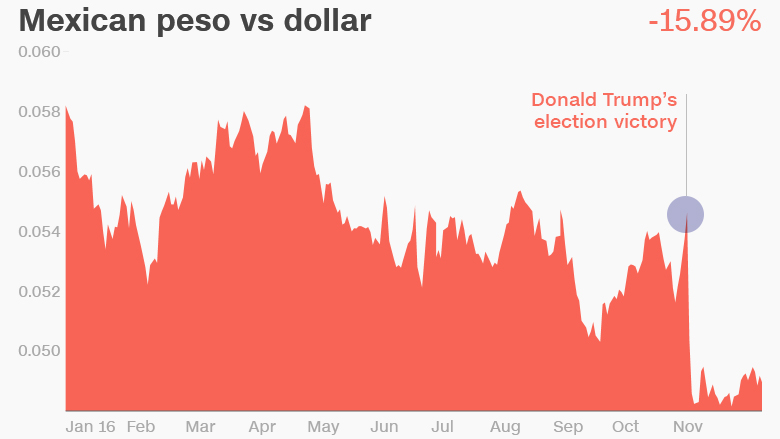 The Mexican peso was hammered by Donald Trump's presidential campaign and election victory. 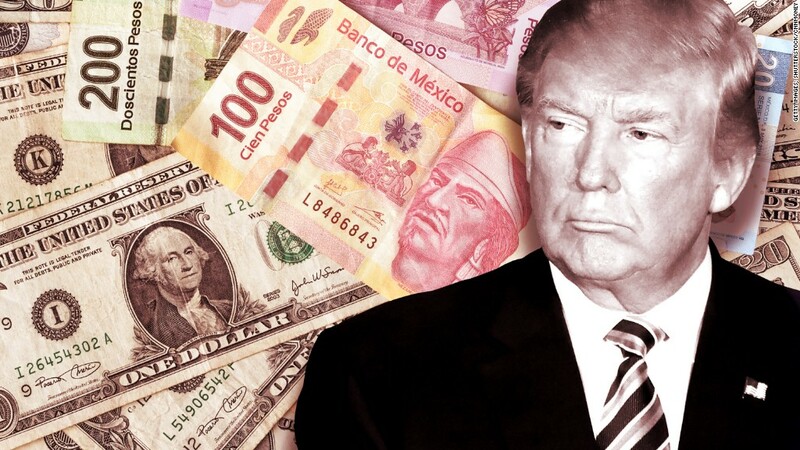 Trump's anti-trade and anti-immigrant rhetoric helped push the currency 17% lower against the dollar in 2016. To help support the peso, the central bank raised interest rates in November. Venezuelan bolivar: Errr, who knows? Venezuela is suffering from an extreme economic crisis. Food shortages are common, and the country doesn't have enough medicine to meet its needs. The IMF expects inflation to rise 1,660% next year. The bolivar collapsed 71% against the dollar in 2016, according to dolartoday.com, an unofficial website that monitors the exchange rate on the ground in Venezuela.